My New Dining Room Lantern is Here! Finally! My new dining room lantern is here! Well, one look at the picture might tell you I chose an entirely different lantern than I originally had proposed. But I’m in LOOOOOVVVVVVVVVVE. If you will recall, I was given a gift card by the good people at Apartment Guide to make over a corner of my home. WHEEEE! A gift card? For me? YES, PLEASE AND THANK YOU! 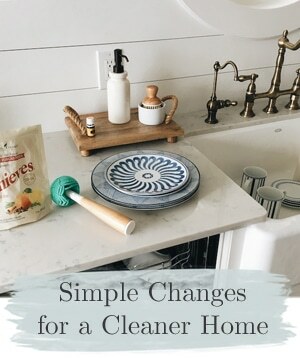 I’ve been on a mission to make my home more like US so getting to shop for my home with a gift card was a dream come true for this mom on a meager budget! Even though I was using a gift card and not my own money, I still wanted to make the best decision I could, since this lantern would be a part of our every day experience of living in our home! I have had a long time love of lanterns, especially ones with character and personality. I have had beautiful old lanterns in EVERY HOME I’ve had. While not everyone might love lanterns like I do, they are a part of what makes me feel at home. Do you have things like that? About 650 of you helped me choose between the two lanterns I proposed. Um, yeah, that is A LOT OF OPINIONS! 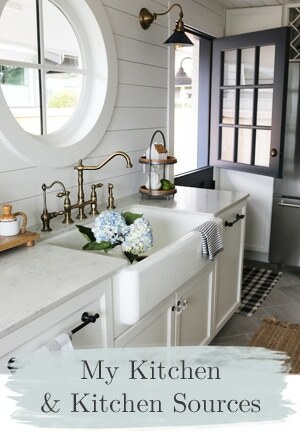 While I am not usually one to let others sway my decisions for my home (after all, I am the one who needs to love my house), you guys rocked the comments with invaluable suggestions and insights. You are smart and have great style too, I might add! And now, a view with the lights off, so you aren’t as blinded by the lightbulbs. How can I thank you enough for taking the time to think about my choices and give your own recommendations and experiences? I was amazed at your generous and insightful suggestions and grateful for your input! You definitely got my wheels turning and I had many “ah ah” moments thanks to your suggestions. In the end, it came down to having to go with my gut on what I love, and as always, making compromises. My compromises usually involve matters of cost, using what I have versus buying something new, making choices both my husband and I will love, and weighing what is practical or makes sense versus what might be fun or frivolous. And of course, there is always the discussion in blogland over whether we should buy something new or remake something old. Shopping with a gift card is an entirely different experience than using your own hard earned money (but still not without stress). 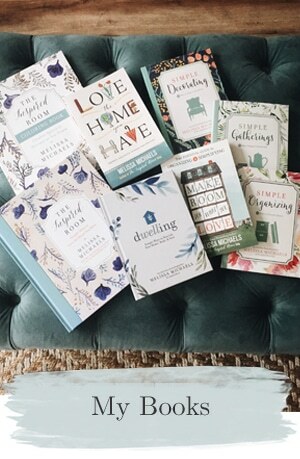 You’d think it would be easy to spend a gift card, but when you are as passionate about your home and surroundings like I am you want to find something you LOVE! And that is not always easy. I was taking photos and it was SNOWING outside! just the way I like it in Winter! Although I tried and tried to find a lantern secondhand, after searching the Re-Store and all second hand lighting options around me, it became clear that second hand was not going to work for me this time. Sometimes I’ve found amazing antique or second hand lighting for my home (that is another post!). But not this time, secondhand was out. Don’t you love how bloggers show ten photos of the same light? When I went to check on the availability of the Wisteria lantern, the overwhelming interest in that lantern apparently had caused it to go OUT OF STOCK for at least a month! Ha! Guess next time I want something I’m not gonna tell you about it first. So that took care of option number one. While I have loved the Pottery Barn bell lantern for years and years now and STILL DO, after careful thought and reading all of your comments about dead bugs in the jar (oh how I love how you thought about the dead bugs I’d be finding hanging above my dinner table!!! ), I decided it was not the one I really wanted for my dining room. That took me on another search for “the right” lantern. Am I the only woman alive that would obsess like this over a dining room light? I think not. I would be lying if I told you there were not a few sleepless nights over this decision. And one final look back from this angle. After researching and considering every lantern option known to womankind, within my gift card budget, and asking for my husband’s opinion, and finding out which lanterns were the right size for my room and table (not too big, not too small), in stock and ready to ship now (because I’m picky and impatient like that), I ended up with this GORGEOUS lantern. Yesterday my husband and I brought out our his and hers ladders (YAY! My new ladder came in handy already!) and installed this Pottery Barn beauty in its new home. Our home. I’m still not done with the dining room but my new lantern helped me taken a giant leap forward towards the character I was hoping for in this small dining room. FINALLY. More old house character in my new house! If this peek at our his & hers ladders nestled side by side doesn’t warm your heart, I don’t know what will. I will say that this is not a very bright lantern so if you need lots of light, you might need additional lighting sources. I have large windows and extra lamps so it works fine for me but it is something to consider. For those discerning readers, it does happen to be the same lantern Holly has in her dining room, and I almost had a heart attack about choosing the same one (cause I like to be original and all) but mine has a copper top and hers is black so I guess we are still unique. She has brilliant taste, what can I say. Thank you, Apartment Guide for inviting me to be a part of the New Year New Space Challenge. Apartment Guide is an online resource all about making the most of your home, no matter where you live. Apartment Guide is owned by Consumer Source, Inc. Apartment Guide partnered with bloggers such as myself to participate in its New Year, New Space Blogger Challenge. As part of that program, I received compensation. They did not tell me what to purchase or what to say about the products used for the New Year, New Space Blogger Challenge. Apartment Guide and Consumer Source believes that consumers and bloggers are free to form their own opinions and share them in their own words. Consumer Source’s policies align with WOMMA Ethics Code, FTC guidelines and social media engagement recommendations. It’s so pretty! I want a lantern for my dining room and have been searching for just the right one. This looks fantastic! It’s gorgeous. I think copper is my favorite finish, I have it all over my kitchen. I also bought a ton of it from Turkey and wish I purchased more! I have some antique copper pots and I’m looking forward to bringing them out! Melissa, I love the copper! So beautiful! And I am so, so happy you went with the bug-free model! The new light vs. the old one – there’s no comparison. Your new light has so much style! Gorgeous. Great choice, Melissa. It looks beautiful! I actually prefer this one over your first two choices. I can relate to the decision making ‘process’. I finally found and ordered the just right faucet fixtures for the sinks in our master bath and upon their arrival discovered I need widespread not center set. Could you hear my scream? I’m happy your choice worked out! His and her’s ladders — too cute. I know how that feels, lol, so frustrating!! Hope you get the right faucets soon! Love it and the happy ladder couple! Beautiful! What a great choice! Love the new lighting! I would love to know the story behind the stained glass in your dining room windows. I’ve seen it pop up a few times and love it! Yes, I love those stained glass windows! I’ve had them for probably 17 years and my parents had them when I was little! They came out of an old church that was being demolished. I’m so happy that you found something that was just right for you! It does look gorgeous in your dining room. I love it, it’s so unique! 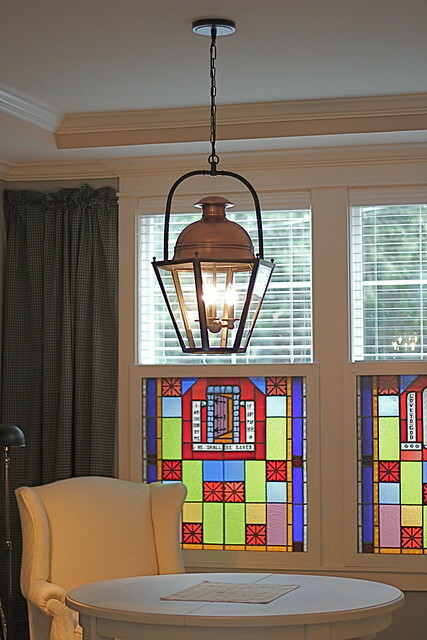 It looks great w/ your stained glass, I like this one better than your other two options. The copper is such a nice touch. I’ve lovin’ the ladder picture, his and hers, now that is cute! I love it! Looks amazing in your home! I love the lantern. The copper top really pops it! Great choice. Your new lantern is just exquisite. 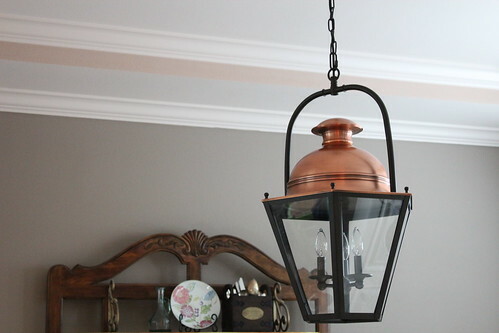 The copper really adds something special to this lantern. While I was one of those who voted for the lantern from Willow House ( Brooke Giantti of Velevet and Linen has two-one in her dining room and one in her office ) I love the one you chose just as much. Thank you! I loved the other lantern too, but when that went out of stock, I decided I too love this one just as much if not more for my space. love it! I love new lamps/lanterns/chandeliers! Easy & quick way to change up a room’s look! Looks loverly! So glad you found what makes you happy! The lantern is beautiful. As others have said, the copper adds so much character. I love the little ditto about the his and hers ladders. 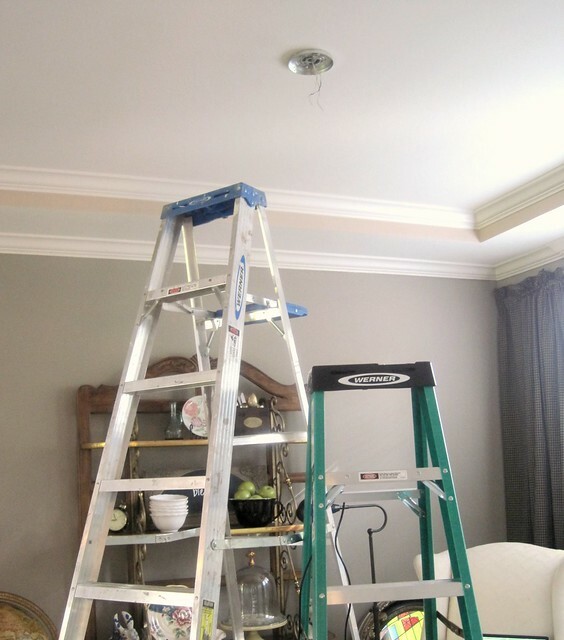 I am inspired to get my own user friendly ladder. It would be a nice addition. Love the lantern. You definitely made the right choice…and oh! for those stained glass panels! I love it!! It’s Ab Fab! What a lovely lantern! The copper colour is a nice change from the usual black or ORB. Thank you, yes, I agree, the copper makes it unique and special! When we were on holidays this past weekend, I was eyeing the lanterns hanging in the hotel lobby…they reminded me of your lantern post. This is just the lantern I have in mind for our dining room. I’ve been looking around for something in copper. This is gorgeous! I love it…….and the lantern! Omigosh I LOVE your lantern light! That would be perfect over our casual dining area. I’m going to search it out right now. And I never thought I would be jealous of another womans ladder lol. But I seriously have ladder envy! Here all this time I’ve been swooning over tool belts but I think a just for me ladder is in my near future heehee. Don’t you love it when you’ve figured out your style and feel secure in your choices?!? It was a late 30’s arrival of security in my style; how about you? The old lamp is where now? New home? Hi Julie….Yes, I was almost 40 before I had confidence in my style too!! Old lamp is probably going to go up on Craigslist….on to a new home! I listed you on my Feature Friday! Love your site and always enjoy sharing it with others. LOVE LOVE LOVE! I LOVE everything about that light. It looks amazing. I’d love to see a photo of the entire rooom. The new light fixture is gorgeous. I love that! And the stained glass is beautiful. It looks very nice. I think I may have voted for the other one too, but I can see why you chose this one for this room. It’s funny that I also got a light put up over the dining room table just yesterday. It’s actually an old chandalier that my husband pieced back together. I’m glad to get it up and plan to do a post on it soon. I love it. Perfect choice! I love how the angles on this lantern juxtapose the sharpness of the stained glass window. It is the perfect choice for the space. 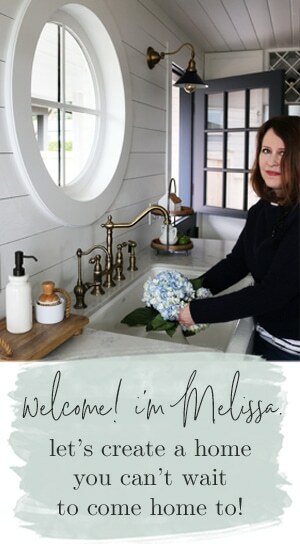 As a new follower of your blog I love your design aesthetic and am inspired by the work that you have done, both in this home and the last one. Lucky you! Beautiful. I love that lanterns are back in style and this one looks amazing in your space. I’ve had my eye on a small “antique”? one thats hanging in a “junk” store near my home. The last time I was there the owner told me she’d make me a good deal on it ’cause it’s been there for a while. The price tag on it was only $28, so I’m not sure what price she had in mind, but DH was in a hurry and I didn’t buy it. DH will be working on Saturday, so I may just slip over there and see if she still has it. It would be perfect in my entry and all it would take is a little rewiring and some cleaning up. Keep your fingers crossed! Ok now we gotta see a pic of the entire room! ;o) Love your choice! 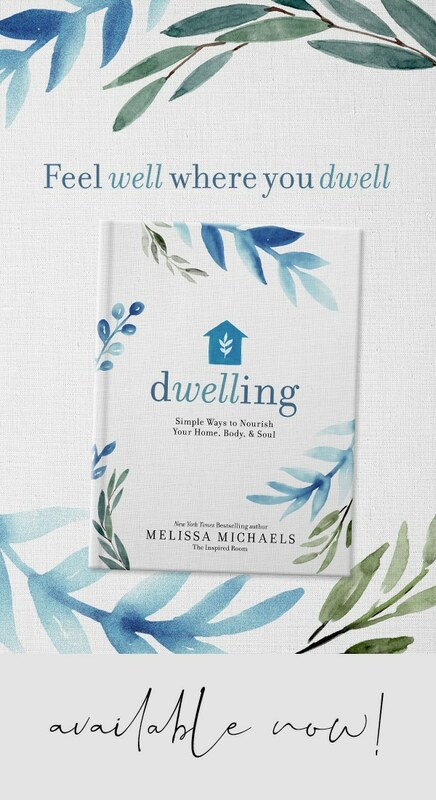 melissa, it’s gorgeous!! i love lighting…i have a lot of chandeliers and sometimes i just stop and stare at them…i’m afflicted! i had gas lanterns on either side of my front door back home in alabama and i so miss them! It is perfect! I love the shot with the stain glass windows in the background, you can really see how well this lantern compliments that room. Beautifully! 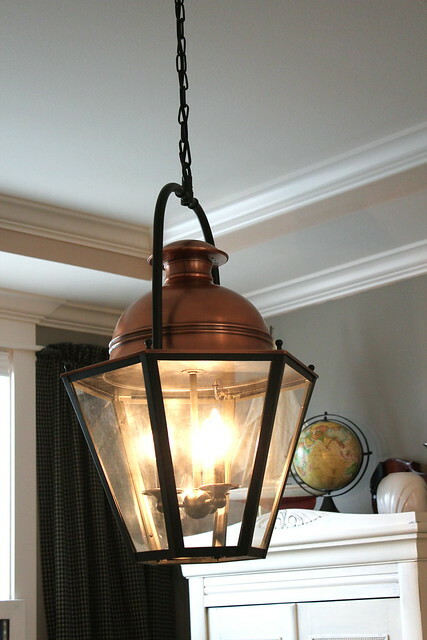 I LOVE the lantern with the copper!! Oh my goodness! I love lanterns too. They just look old fashioned, and I love old fashioned! Copper a new twist! Real liking the lantern it has a little industrial aspect to it always good in my book. Enjoy! Oops, I am soooo sorry to sy this and apparently I am definately the only one but I just don’t like it. I luv luv your home and I really like this lantern but just not in your house. Please don’t all beat me up. Just can’t feel it. I totally agree with you. The most important thing is that you and your family like it. I’m sorry if I offended you. 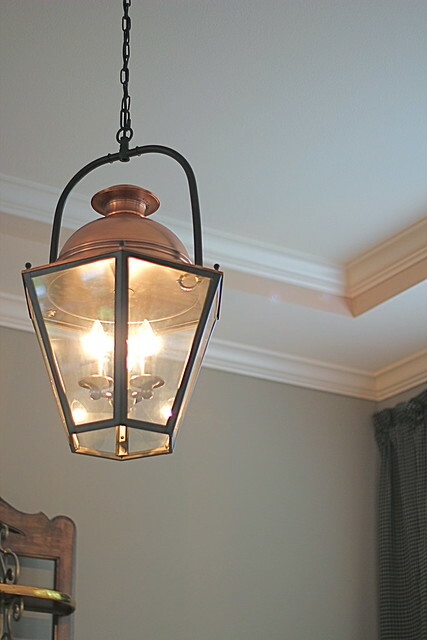 I love that lantern and I think it looks great in your space. 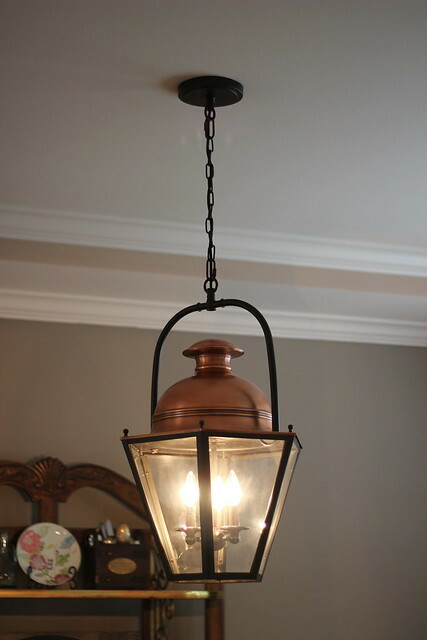 I have been looking at a similar lantern for my dining room, and it also takes (3) 40 watt bulbs (I looked yours up ;) Do you feel your lantern provides enough light for your room, and do you need additional lighting? 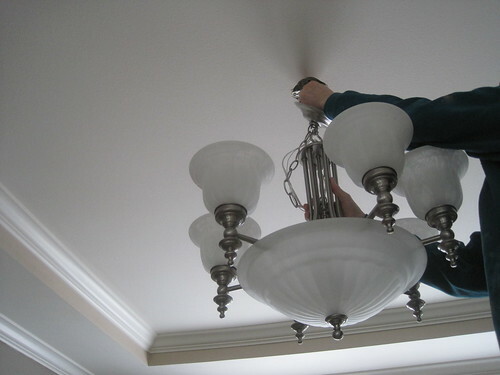 I will be replacing our current chandelier which is 360 watts with 120 and I’m afraid it will be too dim. But I love the lantern I picked out. What to do?! It is not very bright! Depending on your light during the day and other sources of light, you might think it is too dark! I don’t mind for my space as it is only a small dining room and we have lots of windows for daytime. At night, it has lots of ambience and I do have other lamps in space! Hope that helps! 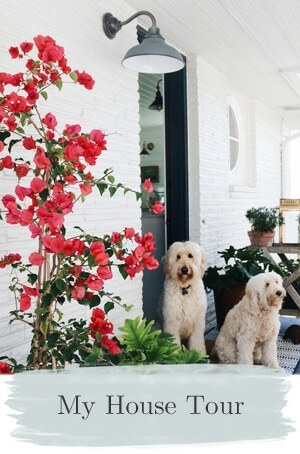 melissa i love your style, im really in love with the copper lantern.may i ask did your recently purchased it from pottery barn searched all over their web page and could not find. would you be so kind to provide more info. thanks. and also thanks for keeping me inspired.